For most people, a headache is a nuisance. But for people with hydrocephalus, a headache can indicate a serious problem requiring a hospital visit, tests, radiation and even surgery. Hydrocephalus is a potentially life-threatening condition in which excess fluid builds up in the brain. It’s about as common as Down syndrome, affecting one in every 1,000 live births. To treat the condition, surgeons implant a straw-like catheter, or shunt, into the brain to drain excess fluid to another part of the body. But shunts have a nearly 100 percent failure rate over 10 years – and diagnosing failure is difficult, according to researchers. A new, noninvasive skin sensor developed at Northwestern University can detect whether a shunt is working in minutes. Meyer’s son, Willie, is among more than 1 million Americans who live with shunts and the constant threat of their failure. Willie has had 190 surgeries, spent many holidays in the emergency room and nearly missed his high school graduation because of emergency brain surgeries for his condition. When a shunt fails, a patient can experience headaches, nausea and low energy. If a patient experiences any of these symptoms, they must go to a hospital and get a CT scan, an MRI or even undergo surgery to see if the shunt is working properly. If left untreated, hydrocephalus can lead to death. Treating hydrocephalus is estimated to cost $50,000 per patient per year, according to researchers, and costs the U.S. health care system about $1 billion per year. 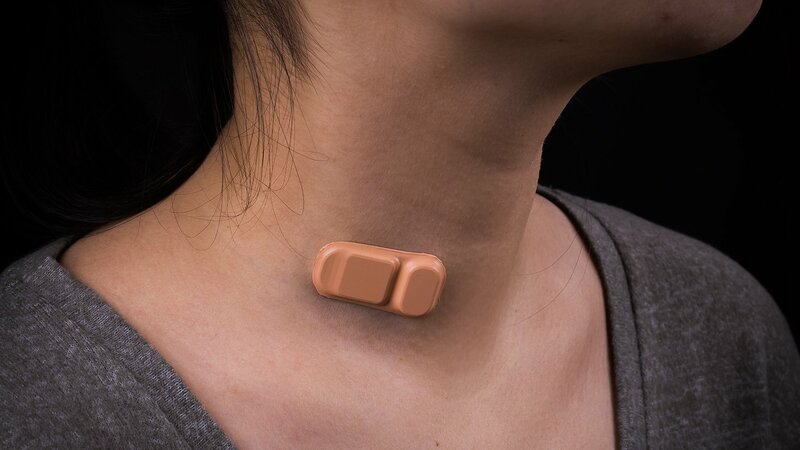 Researchers see their new Band-Aid-like sensor as a way to reduce medical costs and revolutionize the way patients manage the condition, which can affect both adults and children. Developed by the Rogers Research Group at Northwestern, the soft and flexible sensor uses measurements of temperature and heat transfer to tell if and how much fluid is flowing through a shunt. The device has a tiny rechargeable battery built into it and is Bluetooth enabled so it can send measurement readings via an Android app. The device was successfully tested on five adult patients with hydrocephalus in a clinical trial. A larger pediatric clinical trial will begin soon at the Ann & Robert H. Lurie Children’s Hospital of Chicago. Researchers are working on outsourced production of a few hundred sensors to support the pediatric study and further develop the technology. Rogers and Dr. Amit Ayer, a sixth-year neurosurgery resident at Northwestern, are co-founders of Rhaeos, Inc., a company that is commercializing the technology. The study was funded by the Center for Bio-Integrated Electronics at Northwestern with small additional funding through the Dixon Translational Grant at Northwestern’s Feinberg School of Medicine.